“When Leonard Sandridge talks, people listen,” said UVA President Teresa A. Sullivan. In July, you will get a chance to listen to Leonard talk about the transition from 12-14 hour workdays managing a major university to the pursuit of his new passion - uncovering the personal stories of the Sandridges and other families that settled the foothills of the Blue Ridge in western Albemarle County where he grew up. 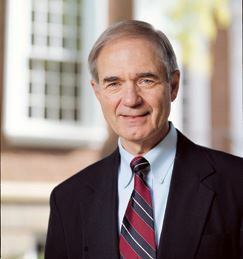 At the University, his responsibilities encompassed oversight of all of UVA’s nonacademic support areas, including athletics, student affairs, management and budget, finance, human resources, Architect for the University, emergency preparedness, police, compliance and the financial and managerial aspects of the Health System. Long before he retired after 44 years at the University, signs of Sandridge's influence and his extraordinary career were easy to see. A reception hall at John Paul Jones Arena and a road were named in his honor. Students created an “I Brake for Leonard Sandridge” bumper sticker. Sandridge worked with five of UVA’s eight presidents and has been honored with multiple awards, including the Thomas Jefferson Award, UVA’s highest honor. In July we will be visiting St. Christopher's School and will meet in Ryan Hall, a dining center located in the lower level of the Luck Leadership Center. In addition to our speaker, we will hear from the School's new headmaster, Mason Lecky, during his first month on the job. You also may have a chance to experience that old school days feeling of going through the cafeteria line.